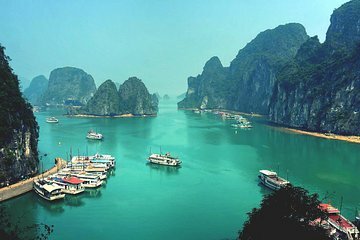 Enjoy a full-day cruise in Halong Bay on a traditional junk boat. After a convenient hotel pickup, embark on a sail through the emerald waters of this UNESCO-designated bay. Admire towering limestone rocks and a grotto with otherworldly stalactites and stalagmites. Take a dip at one of the bay’s many islands, sunbathe on the deck, and enjoy a delicious seafood lunch included in the tour price.